This challenge was about embossing, whether it be heat embossing or dry embossing....since for Creative Scraps Challenge (which is still going on, head over to Molly's blog to join in) I used heat embossing, I decided to dry emboss. I love all of the folders and yet barely use them! So I think this was just the type of challenge I needed!! I totally tried something new....I wanted to utilize more of my scraps so I cut 1" strips of white paper and layed them down on a piece of 5"x4" piece of scrap paper. I used just a very little bit of mono adhesive to hold it down. I than ran my snowflake folder through my epic 6(a machine that's somewhat like a cuttlebug). I removed each strip of paper and inked them in different "Christmas" colors. I apologize, I mean we just got over Halloween and I'm all about Christmas! LOL Anyways, I then reapplied my strips down. I just had to use my Hello Kitty Cartridge again...I just have so much fun with it (image cut at 4", and I Swiss Dots embossed her jacket for a little more dimension)!! 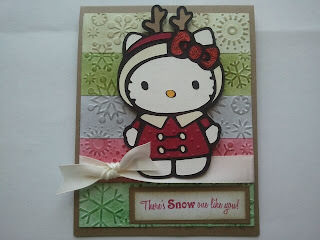 ﻿ Now I finished this card last week and it was missing something so I added some red glitter glue to her bow! And it was the perfect touch! 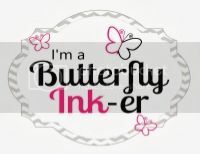 The sentiment is from Scrappy Mom's Stamp Set " Winter Wishes". Be sure to head over to Momo's Blog and join in on her Challenge! This is so adorable - and the white strips are a perfect way to use up those scraps...thanks for the idea!!!! I'm loving the Hello Kitty cartridge...definitely going to have to get that one!!! I love the different embossing strips - great idea - will have to try that technique - beautiful card ! I love this card Trish! Just so cute! My daughter would want that cartridge. Very cute when I read about the glitter on the bow I scrolled back up to see and noticed her antlers. Very cute! Thanks for sharing. I think you did a great job with the challenge and great idea for using all the scraps that we just can't seem to let go of! So cute, Trish. Love all the layers. I will definately have to show Gabby. We enjoyed meeting you. Thanks again. I left a message on my blog for you! I LOVE it Trish...very clever background!!!! I have to try that...its GREAT!!! I really do need to pull out my HK cart....it was one of the first ones I got and used it all the time...I dont think I have pulled it out in at least a year....gasp!!! I love her and I love your idea!! My HK is still M.I.A. Noooooooo!!!!!! I just saw this on Momo's blog... This is adorable!!!! wow! I love it! This card is so adorable!! 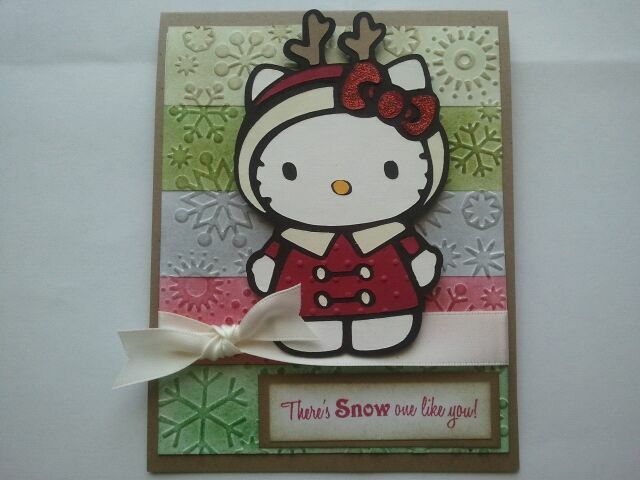 I love that hello kitty girl and that embossing is amazing!! !